Tim Matherly has been a fixture in the world of blue oval drag racing since the mid-1980’s. 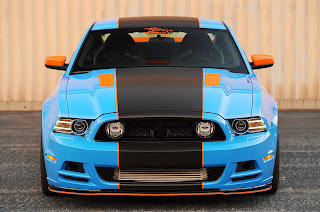 This mild mannered 44 year old has pedaled everything from a Pro 5.0 Mustang, big block Cougar Eliminators, juiced fox bodies, to his current NMRA Real Street ride; a blown 2-valve modular powered 2011 Mustang GT. Tim seems to be one of those guys who have some sort of built-in rev limiter that controls all of his emotions. Do yourself a favor and walk up to him some time at an NMRA race. You would think that under the pressure of a race weekend that he would be operating in high gear. However, that is not the case. While always friendly, his natural demeanor is one that keeps him from ever being too excited or too depressed and he always seems to be running on an even keel. That is just how Tim is. He truly is one of those people who speaks softy and carries a big stick. Tim makes a living by owning and operating MV Performance is located in Statham, GA. MVP specializes in all things Mustang related - from chassis fabrication and engine building to dyno tuning, and high performance parts sales. When Tim isn’t racing or working, which is rare, he spends time coaching his 9-year-old son Dawson’s little league team or with his daughter, Autumn, who is 3. In case you didn’t notice, Tim is 44 years old. Those are human years, not dog years, and so during his time here on God’s green earth he’s had plenty of time to build relationships with a group of companies that are a virtual “Who’s Who” in the world of Ford drag racing. Tim has, and likely will continue to win championships. All that being said, we wanted to find out just what is rattling around in the head of the man who puts the “M” in MV Performance. In the past, we’ve seen wars erupt on Real Street internet message boards regarding rules and who’s car and combo has an unfair advantage. Rarely, if ever, does Tim partake. We figured you, like us, would want to know exactly what he thinks about the NMRA’s 9-second bumper dragging “shift-it-yourself” class otherwise known as Real Street. Matherly is arguably Real Street’s most dominant racer ever. He has compiled championship seasons in 2004, 2007, and 2009. No other RS competitor has better statistics in terms of championships, race wins, and record setting performances. So take a seat, open your mind, and read about it here folks because you likely won’t ever be reading anything like this on a message board! Stang TV: Tim, the NMRA’s Real Street class has long been called a “driver’s class.” However, a vast majority of all mustangs on the streets today are automatics. If you want to keep the “real” in Real Street, why shouldn’t AOD-type Ford automatic transmissions be allowed in the class? Tim Matherly: One of the main reasons for me choosing Real Street was the fact that there were no automatics. It puts more responsibility, ability, or lack there of, in the drivers' hands. I ran Pro 5.0 years ago and put an automatic in my car. The next year I parked it, it was no fun any more. Stang TV: Along the same lines as the last question, what are your thoughts on allowing 4 valve engines, carbureted engines, and non intercooled turbo engines in to the class? After all, OEM fox and newer Mustangs have come with 4 valve motors, carbureted motors, and turbo motors, yet, never has an OEM Mustang come with a centrifugal supercharger. Tim Matherly: I support anything that would increase the car count. I am apposed to intercooled entries because that gives an unfair advantage to the fuel we have to use. The answer to intercooled would be to allow good gas. Any combo is ok as long as the rules are equal. Stang TV: Why did you choose the 2V 4.6-liter supercharged combo for your Real Street car versus any of the other power adder/engine combos available in the class? Tim Matherly: When we decided to get back into racing we looked at what would be best for our business and what we were working with the most. I had fifteen 2V cars in our shop at the time so that was a no-brainer. 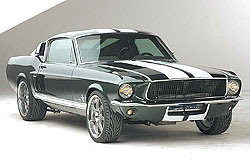 Stang TV: Why did you switch to a 2011 Mustang body when you’ve been so successful with your old car? Tim Matherly: Times are changing so we had to make a change as well. I was talking with Jesse Kershaw from Ford about the BIW (body in white) program and he asked if I would be interested in one when available? I said “Where do I sign?” I then bounced the idea off a few of my sponsors and they said “We back you 100%, go for it.” 14 weeks later, we had the car at PRI show for Ford. Stang TV: Speaking of your new car, you have also chosen to build a 3V supercharged combo. Do you feel that the 3V engine has advantages over the 2v? If so, what are they? What do you feel the ET potential of your new 3V combo is in Real Street assuming your new chassis works as well or better than your old chassis? Tim Matherly: If you have noticed, I have been running my 2V combo in the new chassis. Now that we have a grip on the chassis I can focus on the 3V. I don’t have a good answer yet on any potential for it as it is going to be hard to beat my 2V combination. Needless to say I am not impressed with the 3V yet. Stang TV: We all know that competing in heads-up drag racing means you are constantly pushing your equipment to the edge and parts often break as a result. Back in 2008, you seemed to have been having a lot of engine related problems. Was it in the tuning of the engine or the engine components themselves? What have you learned since then to make your engines last? Tim Matherly: I was trying to win a championship at all costs. Knowing where the limit is and stepping over it will bite you as it did me on several occasions in past years. I was racing too hard as a result we were hurting gaskets. It is easier just to swap an engine that head gaskets. Stang TV: Somehow, some way, you seem to always be at or near the top of the qualifying list, even in “nitrous weather”. How are you able to do this? Tim Matherly: Every point counts towards a championship and in the past I lost by a mere 10 points. That was the difference between qualifying 1st or 2nd and that was a mistake on my part so I try not to let that happen too often. Being a smart tuner has all to do with being competitive in this class, reading the track, the weather, and your opponent. Stang TV: If you take a look at the other engine combos in the class, in your opinion, what is the ET potential of the pushrod blower combo and the pushrod nitrous combo this year? What about the nitrous mod combo? Tim Matherly: I really don’t believe, in my opinion, that we have seen the true potential of the pushrod blower combo yet. ET-wise, I feel they can go high-30s in the right conditions. The nitrous pushrod can go mid-30s in the wrong conditions. Who knows the potential of the nitrous modular? Stang TV: Of these 4 racers: Chris Tuten, Bruce Hemminger, Bryan Meyer, and Yourself, who would you least like to see in the opposite lane? Why? Tim Matherly: I have respect for all our racers in the class. I have always been told in order to be the best you have to beat the best and I would consider those some of the best. Winning a championship proves that you were the best, or luckiest, or both. Stang TV: Rumor has it that nitrous/pushrod stalwart, and past champion Bruce Hemminger is out to prove that you’ve been sandbagging and will be racing this season with a 2V Procharger combo under the hood at some point. That is pretty much the same engine combination that you’ve been running for the past several seasons winning those championships. If this turns out to be true, how fast do you think he will go? Tim Matherly: I will answer this question with a quote from the "Famous In His Own Mind" Robin Lawrence: “The water is warm, come on in…” I know where we are in our program and I know what it is capable of. I sure wouldn’t try and switch to his combination and expect to be on top right out of the gate. At the time of this writing, Tim was busy defending his 2009 Real Street championship status at the 10th Annual NMRA Ford Nationals in Atco, NJ. Tim tallied yet another race win and record setting performance by running as fast as 9.44 at 144 mph in what was a problem free weekend. The car was fast off the trailer and stayed that way. Not only that, but the two other MV Performance backed cars on the property that weekend also brought home the bucks in the Modular Muscle and Factory Stock classes. Not a bad weekend for Tim, wouldn’t you agree? At this time, we at StangTV.com would like to thank Tim for his time in answering our questions. We tossed him one more opportunity to talk about anything he wanted. His response: “I need to put out a special thanks to my partner Shane for staying at the shop so I can race and to my wife for putting up with me for so many years of racing. She has been raising the kids and staying home alone so I can get that edge to beat Bruce...” Last but not least, Tim owes a great debt to his lovely wife, Lisa, who is his crew chief and has been by his side for all the highs and lows of his racing career. This entry was written by by mark@stangtv (Stang TV Forums) and posted here on Monday, July 26th, 2010 at 3:13 pm and is filed under Uncategorized. This article was not written by us, rather gathered using RSS feeds listed here. We take no credit for this article. You can leave a response, or trackback from your own site.